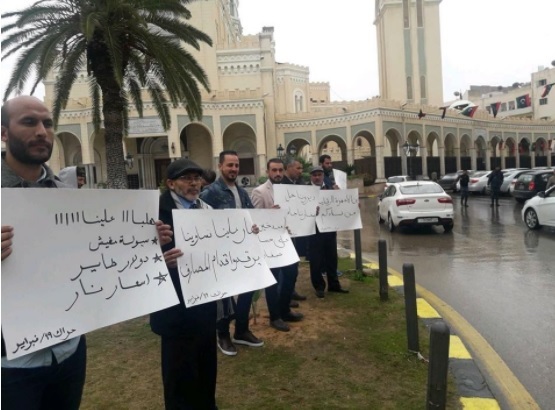 The "February 19" and "Voice of The People" movements held a protest in Algeria Square, downtown Tripoli, due to the deterioration of living conditions in the country. Dozens of people took part in the protest hoisting banners denouncing the rising of prices, lack of cash in banks and the collapse of the Libyan dinar, in addition to the suffering of Libyans who are forced to queue for long hours and days in front of banks to withdraw a sum of their salaries. The organizers of the protest called on the control authorities to lead the fight against corruption and hold accountable all corrupt officials. The protesters also demanded the legislative bodies and financial institutions, especially the Central Bank of Libya, to take practical measures to resolve the financial and economic crisis that is ravaging the country.